In the song, the former Star Search Grand Champion in the Junior Singer Division tells her boyfriend that sometimes a girl needs a token of love to show how much she’s appreciated for all the things she does. Apparently, her boyfriend was thinking the same thing. “Promise Ring” was the lead single from the teenager’s self-titled debut album. The song went to #1 on the U.S. Billboard Bubbling Under Hot 100 list and #66 on the U.S. Billboard Hot R&B/Hip-Hop Songs list. The album scored a Top 20 position on the U.S. Billboard Top R&B/Hip Hop albums chart. 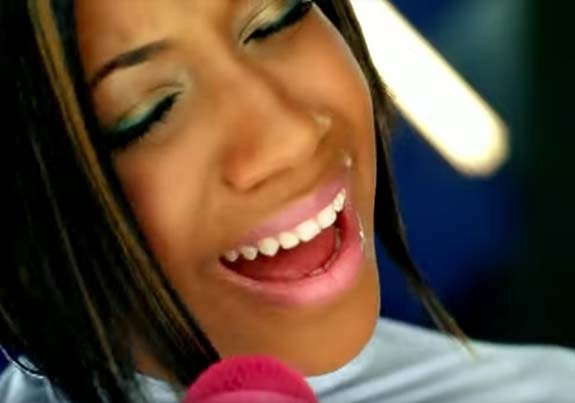 The official video for the song spotlights the teenybopper rockin’ her promise ring with a special appearance by Grammy Award-winner Ciara, who was 21 years old at the time. The video has been viewed on YouTube more than 12 million times. Born in the Bronx, N.Y., Evans rose to fame in 2003 as an 11-year-old contestant on Star Search, hosted by Arsenio Hall. Evans was the only performer in the talent show’s history to earn perfect scores on all of her appearances. The Grand Champion in the Junior Singer Division soon caught the attention of Columbia Records, which signed her to a record deal.